Members of a family grieved yesterday as fire engulfed a house on Likini Street in Salt Lake. A 4-year-old boy died in the fire. A 4-year-old boy was killed yesterday afternoon during a fire at his Salt Lake house, where 21 people lived. After more than an hour and a half of searching for the youngster, firefighters discovered the body of a child, presumably the boy's, inside one of the bedrooms. The fire was reported at 2:20 p.m., and firefighters arrived in five minutes, fire officials said. The boy was found just before 4 p.m.
Police searched the neighborhood earlier on the ground and by air. The fire gutted the three-bedroom home at 4411 Likini St. 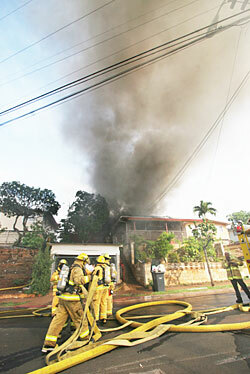 Firefighters battled a blaze that destroyed a house at 4411 Likini St. yesterday afternoon. The older children of Likini Street helped police search for a 4-year-old boy missing during a fire that destroyed his house, but none of the youngsters was prepared for his death. "For real?" asked Daniel Rubio-Guerrero, 10, upon learning that his body was found. "We just started going around looking for him. Was he still alive, because some people get burned but they stay alive?" Kini Carvalho, 6, did not know the kindergartner's body was found and said, "He was hiding. The first thing I wish I could do is go in the house and find him." 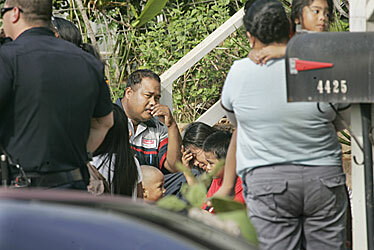 Fire Battalion Chief Kenison Tejada said the home at 4411 Likini St. housed 21 people, and 18 were home at the time of the fire, which was first reported at 2:20 p.m. Of that number, about 12 to 15 were children, Tejada said. Firefighters arrived in five minutes, but the "house was already full involved" from back to front, he said. The fire was brought under control at 2:46 p.m. The fire destroyed the three-bedroom house, causing an estimated $235,000 in damage to the structure and $20,000 to its contents. Shortly before 4 p.m. yesterday, the body of a child was found in a bedroom. The boy's family cried out in pain upon learning of the discovery after an excruciating hour-and-40-minute wait of not knowing his fate. The 18 or more residents of the home, including many small children, gathered in a neighbor's carport while police and firefighters searched for the boy. Tejada said a body had been recovered but had not yet been positively identified. A firefighter, who spoke on condition of anonymity, said the boy's body was not badly burned, and he likely died without feeling any pain. The cause of the fire had not been determined last night, and fire investigators were expected to resume their investigation this morning. Since the whole house was engulfed in flames, Tejada said it was difficult to determine where the fire originated. Cy Villanueva said the fire started in the back of the house and came forward. Police Maj. Kurt Kendro said police conducted a ground and aerial search of the neighborhood, which borders Aliamanu Military Reservation, with 12 officers and a helicopter. "We were very, very hopeful," he said. "We were all hoping for the best." Neighborhood children said the 4-year-old victim attended Pearl Harbor Elementary School and was in kindergarten. Relatives, who came to comfort the family, said the family might have lived at the home for about six months and that they were from the Micronesian atoll of Chuuk. The American Red Cross assisted the residents in finding accommodations.